There’s just two weeks to go until Samsung reveals all about its new Galaxy S8 smartphone. A picture that appears to be the front plate of the Galaxy S8. Alleged colors include glossy black, white, blue, gold and silver. 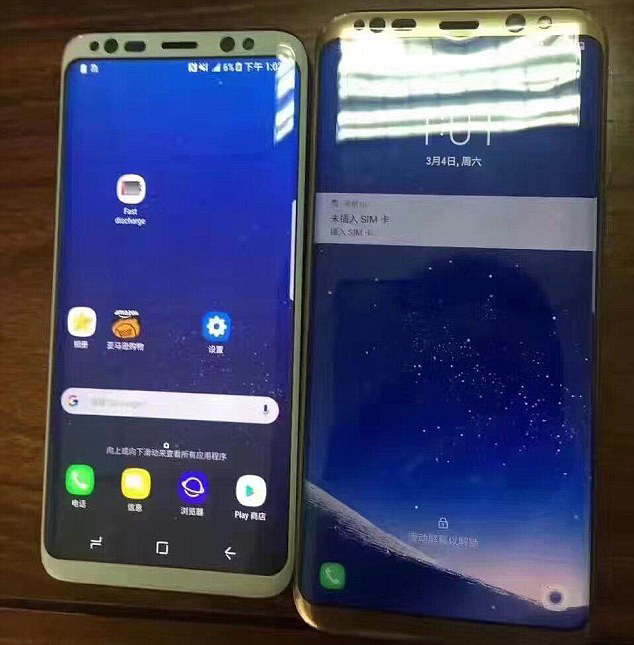 Techdroider tweeted other images of the Galaxy S8 and Galaxy S8 Plus in gold and white, this time with the displays on. It’s thought two devices will be released with an S8 and larger S8 Edge model both featuring a curved AMOLED display, faster processor and improved cameras. Currently, the Galaxy S7 and S7 Edge are only available in black onyx and gold platinum on the Samsung US website, but Samsung has been known to get crazy wacky with colors before. Following the Note 7 recall last year, Samsung released a promotional coral blue S7 Edge. Samsung teased its new phones during its Galaxy Tab S3 tablet event at Mobile World Congress and now it’s given fans another sneak peak at its new phones.